In the Atlanta area everyone is aware of the rush to grocery stores to get supplies in case of bad winter weather. Your landscaping requires emergency supplies also and the good news is that they are non-perishable so that you can purchase them in advance. The wintry weather of January and February will soon be upon us and here are the types of injury to your landscaping you can expect and the steps you can take to protect against damage. Most of our local landscape plants are very hardy during the winter. Most deciduous trees and shrubs (the ones which lose their leaves) laugh at cold weather. They have methods of protecting their buds and stem tissue against even Arctic blasts. Some plants, though, are known to be less cold-hardy. Gardenias, aucuba and lantana are likely to be hurt when temperatures dip below fifteen degrees. The best way to protect them is to cover the entire plant with a tent of plastic, anchoring the plastic to the ground on all sides. Predictions of freezing rain or snow can make any homeowner nervous about their landscaping. 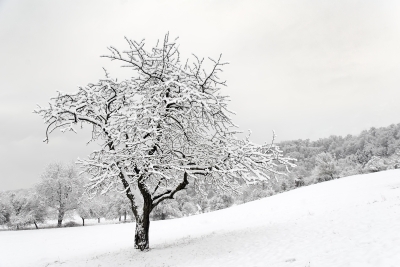 Many landscape plants can tolerate cold but they can’t sustain the weight of ice and snow on their branches. The heavy snow in March of 1993 pulled hundreds of pine trees to the ground and made Leyland cypresses look like peeled bananas all over Atlanta. You can prevent damage by wrapping the needled evergreen plants with twine from top to bottom like a maypole before snow or ice accumulates. In an emergency, duct tape (sticky side out) can be used to truss up your plant. The wrapping can be left on the plant for weeks without harming the plant. If you have a small tree with a natural lean, consider how you could use heavy rope to tie it to a larger tree nearby. Any plant that has leaves during the winter can suffer from drying winds. Evergreens that have been planted this fall can dry out like tissue paper since their root systems are still so small. You can make a wind screen for plants using wooden stakes and a large piece of cloth or plastic stapled to the stakes. The screen does not have to encircle the plant completely, but only break the force of the prevailing wind. Even with a screen, remember to water the plant regularly during the winter. This advice is appropriate for all evergreens after a few days of wind – they need extra water even if the temperatures are low. Even if you don’t protect your plants and they suffer some damage, all is not lost. Drooping limbs can be propped up, fallen trees can sometimes be pulled upright. Dried out plants sometimes sprout back from their roots. Many times, the best advice after a winter storm has wreaked havoc upon your landscaping is to simply wait and see. Spring will come eventually and an evaluation of what should be done can be made then. If in doubt call the landscaping professionals at Hutcheson Horticultural and we can evaluate the landscaping at your home or business and perform any necessary maintenance to ensure that your plants will be in great shape for the upcoming growing season.